In the past on the Air Quality Matters blog and elsewhere I have talked quite a bit about transit-oriented development or TOD. But, I’ve yet to discuss – here or elsewhere – development-oriented transit or DOT. That stops right here, right now. Whereas TOD is development that is built up around transit stops and train stations – hence the “transit” reference – DOT is transit – bus and rail – that develops or is built out (extends outward) from where development already exists. One of the best examples I can think of is in the community of Morgantown, West Virginia with a Group Rapid Transit (GRT) system that connects West Virginia University (WVU) with portions of Morgantown itself. The GRT operates in all kinds of weather, has an automated feature for operation, is very respectably patronized and by university students especially during the Fall and Spring semesters, and, it doesn’t pollute the air, except from perhaps microscopic bits of rubber coming off of tires on which the vehicles roll. 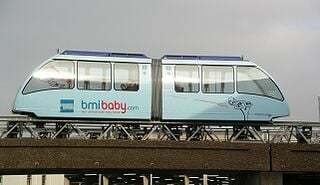 Another example coming to mind is the Las Vegas, Nevada monorail system. On the Las Vegas Strip (where the monorail resides), this particular service is obviously an afterthought as the Strip itself predates the monorail by quite a number of years. The monorail is there to serve hotel guests, primarily. These DOT systems, from the sounds of things, serve specific groups. Folks that I can think of right off the bat that could really benefit from such DOT are seniors. So, a system that could get the elderly to doctors’ appointments, the grocery store and other kinds of stores and entertainment venues (I’m thinking movie theaters, casinos, arenas for operas and plays and sports venues, for example) and back again, safely, reliably, comfortably, with service being frequent, quick, that doesn’t charge an arm and a leg to use (is inexpensive to ride, in other words), well, there is a lot to be said for just such a system. Even better if the system operates using renewable or sustainable energy and is quiet to boot. Is there a fixed-guideway system that can do or be all of that and then some? The answer is: yes. If you’re wondering whether there are any PRT’s already in service, there are. One is in operation at London, England’s Heathrow Airport – the system is ground-running meaning PRT vehicles operate on the same level or plane as motor vehicles. 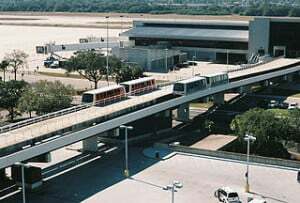 Another is the Tampa (Florida) Int’l Airport people mover. (See photo at right). Then there’s TransitX™. And, what is TransitX™? Okay, so picture a rail guideway, but not just any rail guideway. Think “podway.” Moving with the greatest of ease, podways can be built above-ground or subsurface. Passenger and cargo hauling? No problem. In fact, with features like: Multiple-occupant-per-pod carrying capability, per-hour passenger-carrying capacity rivaling and besting that on roadways, and multi-speed operation, said system can, literally and figuratively, go the extra mile. Getting the picture? Two locations I can think of where application of TransitX™ would, in my mind’s eye, make absolute sense are Bakersfield and Fresno, both of which are located in California’s San Joaquin Valley. I could definitely envision something on this order employed to shuttle high-speed rail patrons between the yet-to-be-built California high-speed train stations and the existing Amtrak stations in both of the aforementioned communities. Besides the station-to-station application, there could be in-between stops. To facilitate passenger boarding and alighting at stops, use of branch lines for this purpose are required. Whether application is overhead or subsurface, there is no interaction whatsoever with ground-based motor vehicle traffic, and, therefore, a collision between a pod and a car, for example, is an impossibility. Okay, so one of the big questions that I have, it being, even if infrastructure construction cost is comparable to road-building infrastructure cost, why even use a system of this nature if roads and automobile access for a great majority already exists? Access being the operative word here, if such is accessible to a broad range of people, that would be desirable in my view. And reach? As long as pods (in the case of TransitX™) or a similar type of system takes riders where or very near to where patrons need and/or want to go, then that aspect too speaks volumes. Making a system like this even more flexible is the ability to add on infrastructure based on need which would effectively expand transport vehicle reach and access. The network can be scaled up or down depending. As to service frequency, company CEO Mike Stanley offers, “Our goal is Zero Wait [time] for the majority of passengers and 95% of waiting times are less than 60 seconds.” Another plus. If transport can be achieved with little to no energy draw from the electric grid (such as is possible with solar power and infrastructure-supported energy storage capability), then honestly, that’s tantamount to having one’s cake and eating it too. What’s more, where a system of this nature could fill in for an existing roadway, pavement could be replaced with a green space or a greenway. As such in cities where deployed, this could do much to reduce what is known as the urban heat-island effect. And, I would be remiss if I neglected to say that anywhere there is a reduction in internal-combustion-engine-powered motor vehicle use, cleaner air results. Will we see more DOTs and PRTs as time goes on? Quite possibly. As a matter of fact, we could be witnessing the beginning of a development-oriented transit and personal rapid transit system revolution here folks. This post was last revised on Jan. 23, 2019 @ 6:57 a.m. Pacific Standard Time.